TCM Week spotlights a highly subjective selection of the week’s essential or undiscovered movies on the Turner Classic Movies channel to help plan movie viewing, DVR scheduling or TCM Party attendance. All times are EST. Bette Davis is absolutely brilliant at playing twin sisters, one naughty and one nice, in this movie. Both are in love with the same man (Glenn Ford), but the naughty one steals him away from the nice one and the couple marries. When the naughty twin dies accidentally, the nice one takes over her life. Davis relies on attitude and gesture, rather than clothing or hairstyle changes, to differentiate the twins, and later, effectively captures the awkwardness of one twin imitating the other’s completely opposite nature, while avoiding any appearance of acting. To sum up, she is amazing. Before the musical Annie Get Your Gun, there was this 1935 version of the sharpshooter’s life story, starring one of my favorite movie stars, Barbara Stanwyck, as the title character. It was director George Stevens’ second A-picture, after Alice Adams, and continued his hot streak, one that included Swing Time, Vivacious Lady, Gunga Din, A Place in the Sun, and Giant, among others. 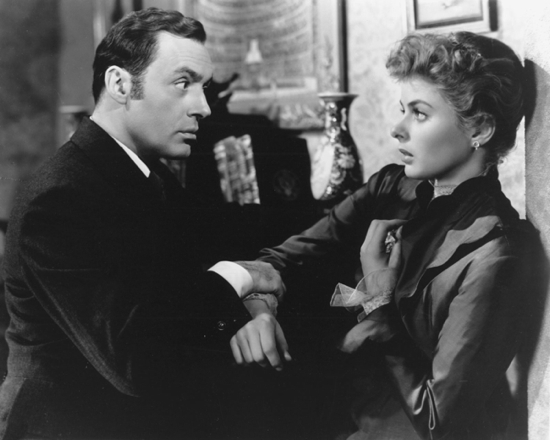 Ingrid Bergman regards Charles Boyer with some suspicion...as she should. Though multi-talented Angela Lansbury is TCM’s star of the month, she isn’t the star of this movie — Charles Boyer and Ingrid Bergman are — but she did earn an Academy Award nomination for Best Supporting Actress for her work. Bergman also earned a nomination, for Best Actress, and won the award, edging Barbara Stanwyck in Double Indemnity. Watch and tweet with #TCMParty. This Cold War movie, made while the HUAC hearings were roiling Hollywood, exemplifies the ideological conflict between the USA and the Soviet Union in the story of a Russian ballerina (Janet Leigh) attempting to defect. The rare starring role for Franchot Tone (Five Graves to Cairo) as the prosecutor whose wife (Loretta Young) could save a condemned man, but only if she reveals information that would humiliate her husband. During the WWII Blitz, a detective known as the Lone Wolf (Warren William) is on the trail of Nazi spies. This movie interests me because it mines similar territory as Powell & Pressburger’s Contraband. Today’s schedule features two different movie stars. Beginning at 6:00 a.m., Elvis Presley stars in Clambake, followed by It Happened at the World’s Fair at 8:00 a.m., and Spinout at 10:00 a.m. Then TCM celebrates the 100th anniversary of José Ferrer‘s birth with a block that starts at noon with The Caine Mutiny. Other classic movies featuring Ferrer follow: I Accuse (4:00 p.m.), Deep in My Heart (5:45 p.m.), Cyrano de Bergerac ’50 (8:00 p.m.), and Joan of Arc ’48 (10:00 p.m.). Posted on 1 January 2012 by PaulaPosted in 2012 Picks, TCM PicksTagged 1930s, 1940s, classic film, classic movie schedule, classic movies, TCM, TCM Party. Great choices, Paula! I can hardly wait, especially for The Gaslight TCM Party, and A Stolen Life. Also, I’ve had Annie Oakley in my collection forever, and I share your fondness for Stanwyck, but I’ve never seen it. Your write-up makes me want to definitely tune in! Thanks Karen! I’ve never seen all of Annie Oakley either, what I did see was a while ago so I’ve set the DVR. I wish A Stolen Life was on at 8:00 p.m. instead of 8:00 a.m. (EST), that would have made a great TCM Party. Happy to hear i’ll see you Wednesday for Gaslight tho :). These are fantastic looking choices and I haven’t seen a single one! I hope to catch “The Stolen Life” with Bette Davis. I will have to record it, as I will be at work! Never heard of it before. Thanks! TCM never disappoints and neither do your recaps, which are now a must for me. I’m afraid I may be starting to seem like a stalker because I tell you so often. In any case, I will not stop.